Institutional investors make up a diverse group, each operating with different mandates, constraints, and risk-adjusted return preferences. However, they are often mistakenly treated as a homogenous group of investors, while there is value in better understanding the unique investment preferences and regulatory conditions of different segments. Therefore, the Taskforce commissioned Convergence to support in segmenting the private sector ecosystem to better understand how to drive more institutional investment towards the Global Goals in developing countries. Tideline contributed in an advisory role. This resulting report provides an analysis of the investment motivations, requirements, and constraints of six segments of institutional investors: I) pension funds, ii) insurance companies, iii) sovereign wealth funds, iv) commercial banks and investment banks, v) private equity firms, and vi) asset/wealth managers. Blended finance structures must create assets that fit within the mandates, constraints, and risk-adjusted return preferences of each institutional investor segment. 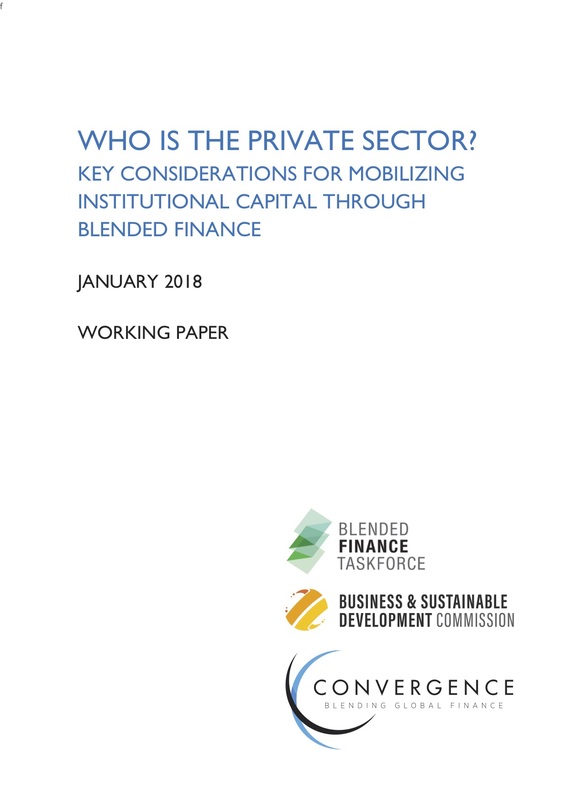 Based on our research, there are five key considerations that will determine whether and to what extent an institutional investor participates in blended finance: I) communication and messaging, ii) policy and regulation, iii) mandate, iv) allocation and capacity, and v) transactional factors.